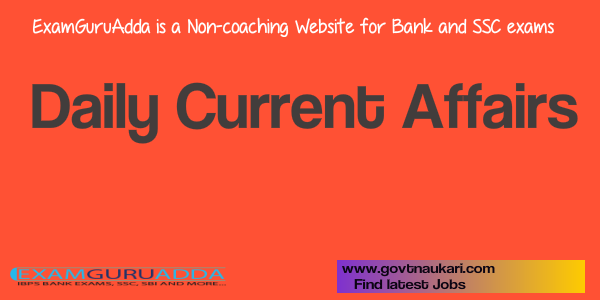 Dear Readers, we are presenting Today Current Affairs for All Exams- 11th April 2017. Daily Current Affairs and General Knowledge is very helpful for IBPS Bank Exams, SBI , RBI Assistant,NIACL, SSC and Railway Exams. 1. United Nations (UN) Secretary General Antonio Guterres has bestowed the highest honour UN Messenger of Peace upon Nobel Peace Prize laureate Malala Yousafzai. 2. She was described as a symbol of the most important thing in the world-education for all. With this, she became youngest ever UN Messenger of Peace. 1. Colson Whitehead’s celebrated novel The Underground Railroad has won the 2017 Pulitzer Prize for fiction. The novel is about an escaped slave that combined liberating imagination and brutal reality. 2. Earlier in November 2016, the novel had received the National Book Award of US. This makes Colson Whitehead first person to win Pulitzer and National Book Award for fiction in last 20 years. 1. The Survey General of India (SOI) completes 250 years. 2. The government launched 'Nakshe mapping portal' a dedicated website allowing the access to the public to download 3,000 maps prepared by the Survey of India (SOI) but made Aadhaar mandatory for the purpose. 1. Kerala-based NBFC Manappuram Finance will launch its own co-branded prepaid card in the tie-up with YES Bank to promote digital financial transactions. 2. The 'Manappuram YES Bank Prepaid Money Card' can be pre-loaded up to a maximum amount of Rs. 50,000 and then be used to withdraw money from all ATMs. As the card works on the popular MasterCard and RuPay networks, it can also be used for online transactions and at merchant establishments with PoS terminals. 1. Mukta Dutta Tomar has been appointed as the next Ambassador of India to the Federal Republic of Germany. 2. She is presently Additional Secretary in the Ministry of External Affairs. Earlier, Gurjit Singh was holding this post till in March 2017. 1. The government has appointed retired Supreme Court judge Shiva Kirti Singh as the next chairman of the Telecom Disputes Settlement & Appellate Tribunal (TDSAT) after replacing of Justice Aftab Alam who was retired in June 2016. 2. The appointment is for a period of three years from the date of assumption of office. 1. UNHCR, the UN Refugee Agency, announced the appointment of internationally acclaimed actress and philanthropist Kristin Davis as its Goodwill Ambassador. 2. UNHCR Goodwill Ambassadors are celebrity representatives of the Office of the UN High Commissioner for Refugees (UNHCR) who use their talent and fame to advocate for refugees. 1. Carme Chacon, the first female defense minister of Spain and a prominent socialist party leader, has died aged 46. 2. Before taking charge of the defense ministry, she had previously been the minister of housing and a national lawmaker.